The Florida Supreme Court has reversed course on a case regarding a minimum wage ordinance in Miami Beach. Last year, the high court agreed to consider whether the city should be allowed to set its own minimum wage. Now, with three new justices on the bench, the court has decided not to hear the case. That means the lower court ruling against the city stands. The Florida Restaurant and Lodging Association (FRLA) was one of the plaintiffs that sued Miami Beach. “This is a recognition of the constitutionality of the statute and says that the legislature does have the ability to say that there will be one consistent, statewide minimum wage,” says Samantha Padgett, FRLA General Counsel. The Miami Beach City Commission in 2016 voted to phase in a citywide minimum wage of $13.31 an hour by 2021. That would be about five dollars more than the state’s minimum wage, which rose to $8.46 in January. “We’re pleased to have some consistency for employers in the state of Florida so that they know they can rely on the preemption as it stands in Florida statute,” Padgett says. Miami Beach leaders argued that a 2004 constitutional amendment passed by voters allowed municipalities to set their own minimum wage. They believed the amendment superseded a 2003 state law that prevents local governments from setting their own minimum wage. 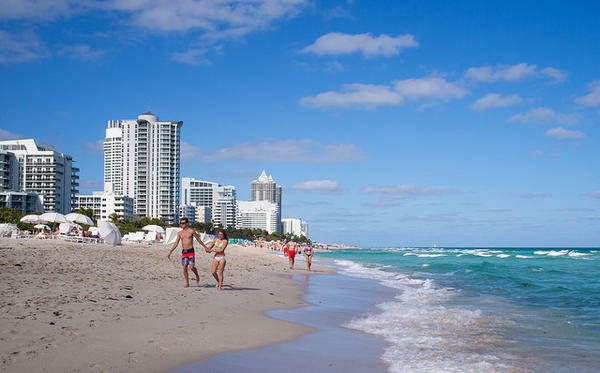 Then-Mayor Philip Levine told WLRN the proposal was “a minimum living wage to make sure people can live comfortably” because of the high cost of living in Miami Beach. But plaintiffs said it should be up to businesses to decide whether to pay their employees more. “The Florida Chamber of Commerce is pleased that Florida’s highest court agreed that Miami Beach’s ordinance was unconstitutional,” said chamber President and CEO Mark Wilson in an email statement. “Today’s Florida Supreme Court action serves as a proof point to other local governments that a patchwork of mandated wage regulations are against the law."